Numark Night Time Sleep Aid 20 Tablets Diphenhydramine Hydrochloride 50mg. An aid to the relief of temporary sleep disturbance. 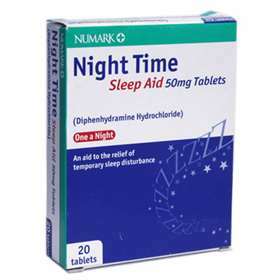 Numark Night Time Sleep Aid 50mg tablets contain Diphenhydramine Hydrochloride which is a sedating antihistamine to help you sleep. These tablets are designed for short term use. Dosage: Adults and children OVER 16: One tablet to be taken 20 minutes before bed. Warning: Do not exceed the stated dose. If symptoms persist and you feel like you are suffering with consistent insomnia please consult your GP further. Ingredients per tablet: Diphenhydramine Hydrochloride. Also contains lactose.